Why all the talk about omega fatty acids lately? Unsure how to supplement your horse’s diet appropriately? An understanding of how omega-3 fatty acids function will help you determine the best diet for your horse. See the infographic here. Omega fatty acids are a form of polyunsaturated fat (fat molecules that have one unsaturated carbon bond) that the body derives from food. Omega fatty acids are known as “essential” fatty acids because they are important for good health. Horses cannot produce these on their own, which means that they must be provided by a balanced diet. Once ingested, omega-3 fatty acids can convert into eicosapentaenoic acid (EPA) and docosahexaenoic acid (DHA). EPA and DHA are intermediaries in the formation of eicosanoids — which affect many systems throughout the body. Eicosanoids have the potential to reduce inflammatory responses, support immune function, and enhance fertility. The ratio of omega-3 to omega-6 fatty acids directly affects the type of eicosanoids that are produced. What are the Sources of Omega-3 and -6 Fatty Acids? Omega-3 fatty acids are found predominantly in leafy plants, which of course is the most traditional component of equine diets. 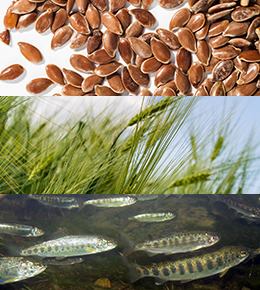 Linseed oil (also known as flax seed oil), canola oil, and fish oil are also rich sources of omega-3 fatty acids. Omega-3 fatty acids derived from fish are not ideal for horses, since fish is not a component of the natural equine diet, so omega-3 supplementation in the equine diet is therefore driven primarily by plant-based material from flax seed oil and canola oil. Omega-6 fatty acids originate from the oil of cereal grain and seeds. 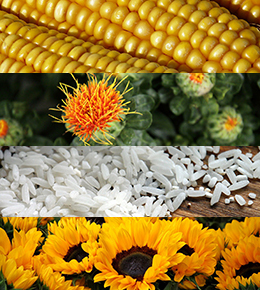 Examples of foodstuffs with high omega-6 content include corn oil, safflower oil, rice bran, and sunflower oil. Performance horses and those that are hard keepers tend to need more grain (which is naturally higher in omega-6 fatty acids) and less forage (which is higher in omega-3 fatty acids). This is important because while horses need both sources of omega fatty acids, a diet with a higher omega-3 to omega-6 ratio is more desirable for their overall health. Why are Omega Fatty Acids Important for the Equine Diet? Once ingested, fatty acids are metabolized by the body to produce prostagladins, which are a group of hormone-like lipid compounds that affect important functions throughout the body. They play a large role in inflammation. Researchers have evaluated horses that were supplemented with omega-3 and -6 fatty acids to determine if there is a change in the level of inflammation. The result of this supplement has been improved coat, skin, and hoof health, strengthened immune systems, increased fertility, weight management, protection of horses with EIPH (Exercise-Induced Pulmonary Hemorrhage), lowering of heart rates, and protection of red blood cell membranes. A study performed by Kentucky Equine Research showed that 60ml a day of fish oil supplementation increased serum, red blood cells, EPA, and DHA in horses (Pagan, Lawrence, Lennox). 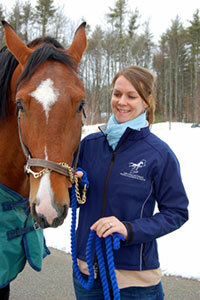 Written by Katy Raynor, DVM, New England Equine Medical and Surgical Center. Katy can be reached at 603-749-9112 or kraynor@newenglandequine.com. How Can I Supplement My Horse’s Diet with Omega Fatty Acids? Flax seeds contain high levels of omega-3 fatty acids. Omega Horseshine by Omega Fields is made with stabilized, freshly milled flax seed that meets standards for human consumption. Horseshine helps maintain a shiny healthy coat, strong solid hooves, and top performance for horses. If your horse was turned out with access to all the natural grasses and plants of your region, they would naturally be supplementing their diet with omega-3 fatty acids. Unfortunately this isn’t the case, and supplementation can significantly improve your horse’s overall health. Cushings and IR horses can also benefit from omega-3 supplementation, as long as the Non-Structural Carbohydrate (NSC) level is low. Omega Horseshine has a very low 4.4% NSC value. Many equine nutrition experts recommend that horses eat fats in the amounts and types that mimic their ancestral diet, which means a high forage diet with minimal concentrates (grain). Ground flax seed has omega-3 and omega-6 levels that are the closest to fresh grasses. For this reason, Omega Horseshine is one of the safest and most natural ways to supplement the healthy omega-3 fat in animals. Learn more about nutritional management of insulin resistant horses on our blog. 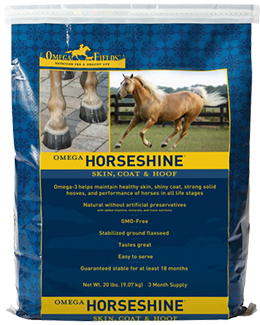 The Cheshire Horse offers a variety of omega fatty acid supplements. 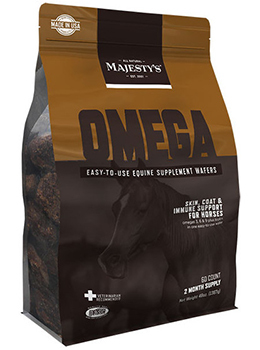 Majesty’s Omega Wafers allow you to easily supplement your horse’s diet with a wafer treat, rather than a top dressing on their feed. Cocosoya Oil from Uckele contains a highly digestible blend of coconut and soybean oils to provide your horse with omega fatty acids. Amplify from Purina Mills is a high-fat, controlled starch extruded nutritional supplement that will help your horse maintain body condition. Renew Gold from Manna Pro provides omega-3 fatty acids through a blend of rice bran, coconut meal, and flax seed. Can Omega Fatty Acids Benefit People Too? Just like in horses, people need a balanced diet in order to obtain the appropriate ratio of essential fatty acids. Balancing this ratio by increasing intake of omega-3 fatty acids can be achieved by supplementation. Simply Omega-3 and Mega Omega from Omega Fields are flax seed supplements that are high in fiber and omega-3 fatty acids, and free of gluten and sweeteners. These products are new at The Cheshire Horse, available both in-store and online. Visit Us At the Equine Affaire! Join The Cheshire Horse with Omega Fields at the Equine Affaire November 13-16 in Better Living Center booth 204 to talk with product experts, win great prizes, and take advantage of incredible show specials available at this event only!